A disappointing performance saw Lewes unable to break down a hardworking Molesey side in this FA Cup preliminary round tie, with the sides now needing to meet again in a replay at the Pan in eleven days, reports Tom Harper. Darren Freeman made several changes to the side that won 2-1 at Dorking Wanderers last Saturday, including handing a first start of the season to Lloyd Cotton after the Lewes captain made his comeback from injury for the development squad during the week. The first half saw plenty of endeavour but very little quality from either side, as the Rooks struggled to find their passing rhythm against their opponents, who were pressing high up the pitch and always looked capable of winning the ball back in dangerous areas. The only half-chance of the half fell to Lewes, who saw Lloyd Cotton send a far-post head from a James Hammond free-kick straight at Sam Johnson-Freeman in the Molesey goal. The hosts made a bright start to the second half, with Tayo Oyebola being put clean through down the right before scuffing his attempted finish, allowing Frankie Chappell to clear. Good chances remained few and far between during the second period, however the best of the chances that were being created were falling to Molesey, who saw Manny Quarshie miss the target from close range after good play down the left by substitute Ashby Charles. 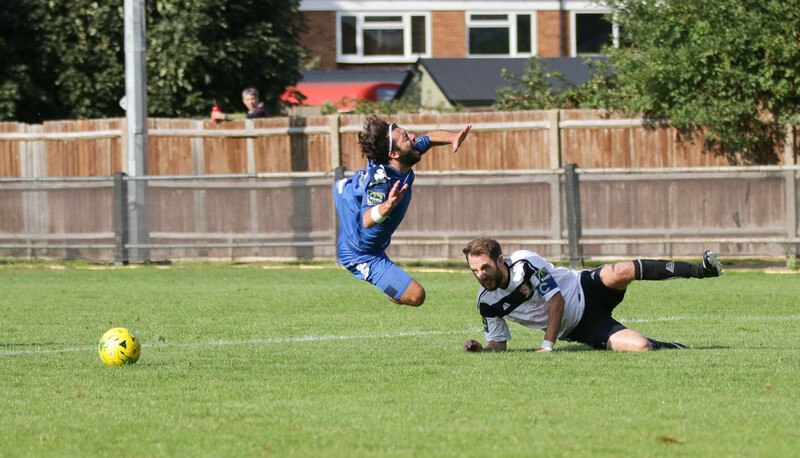 The Rooks nearly made the most of this let-off minutes later, as Lloyd Cotton saw a powerful header from a Nico Cotton corner cleared off the line by Sam Labinjo. Both sides seemed keen to try and win the game during the closing stages, whilst perhaps realising that a replay was the most likely outcome after such an evenly-contested game. Despite this, Lewes felt they should have been handed a great chance to secure a win with the final kick of the game, as Billy Medlock appeared to be fouled in the penalty area by Matt David after latching onto a Jonte Smith flick-on. Despite the appeals from the Rooks players and travelling fans behind the goal, the referee saw the incident differently and gave Medlock a second yellow card for diving, meaning Lewes had to see out the final few seconds with ten men. This was a disappointing performance from Lewes, who never really got going against a hardworking and disciplined Molesey side, who did more than enough to earn a replay at the Pan. Post match Assistant-Manager Ross Standen gave an honest assessment of the performance when he spoke to Barry Collins. Pictures from the game, thanks to James Boyes, can be found here. The Rooks return to league action on Bank Holiday Monday when they welcome Bognor Regis Town to the Pan, kick-off at 3pm.